I'm currently in the midst of planning my holiday outfits, and as I go down the list of events on my calendar, there's one thing in particular that I'm planning on wearing for any and all occasions. Seriously, whether it's a family gathering, drinks with friends in my hometown, or the office holiday party, there is a plethora of cool (and versatile) holiday tops currently sitting in my shopping cart, and they all have one thing in common: They're made of luxurious velvet. 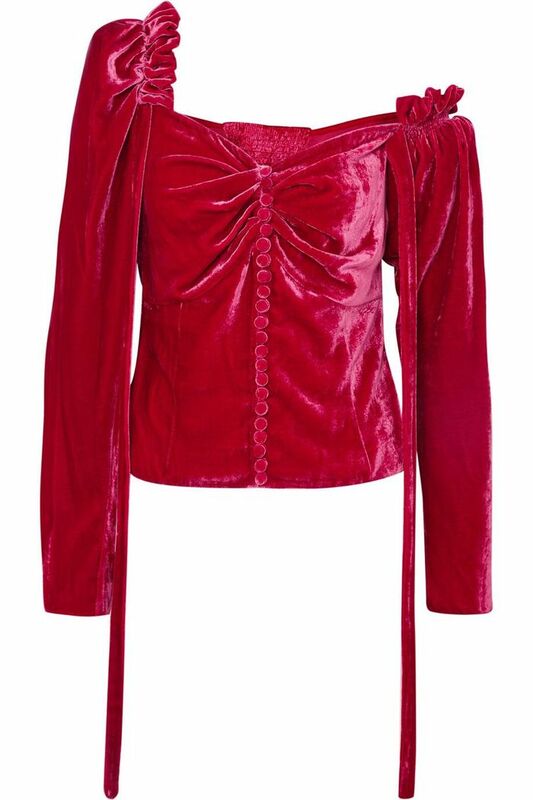 For me, just seeing these velvet holiday tops online ignites a serious excitement for the holidays ahead. Since this time of year is known for being a hectic one, I have a feeling that the following velvet tops will be the answer to all my outfit drama. Instead of planning completely new outfits for each occasion, I'm shopping for the perfect holiday top that does it all. Whether styled with casual staples like jeans and ankle boots or dressed up with skirts and tights or leather pants and heels, the following 19 velvet holiday tops are guaranteed to look good and feel perfectly festive. A few of the tops you can expect to see in my shopping cart (and up ahead) include the luxurious jewel-toned blouse by up-and-coming It brand Magda Butrym and the delicate lace-and-velvet Cami NYC tank I plan to layer with. These styles and even more beautiful options lie ahead. Simply keep reading to shop the 19 velvet holiday tops you can wear with jeans, skirts, trousers, and everything else. The velvet top to end all velvet tops. We had to include this dreamy bustier because the velvet straps are insanely cool. Wear as is for a night out or layer over a thin turtleneck for daytime. Perfect for holiday parties of any kind. This neckline is so elegant. Just wear it with your favorite jeans. We're still swooning over square necklines. Holiday travel, but make it fashion. Style this dramatic top with leather pants and ankle boots. When cutouts look this chic, we're totally on board. The layering possibilities with this top are endless. Ideal for tucking into your favorite high-waisted bottoms. The front is just as cool. Yes, romantic blouses are still having a moment. Style just like the model with straight-leg jeans and ankle boots. Now that you have your holiday tops sorted, shop our favorite jeans of the moment.